The 30 Stack is outstanding versus the option because it creates a defensive triangle on the perimeter. As such, the veer option is defended (see diagram below), as well as the gun option, which keys the backside end. 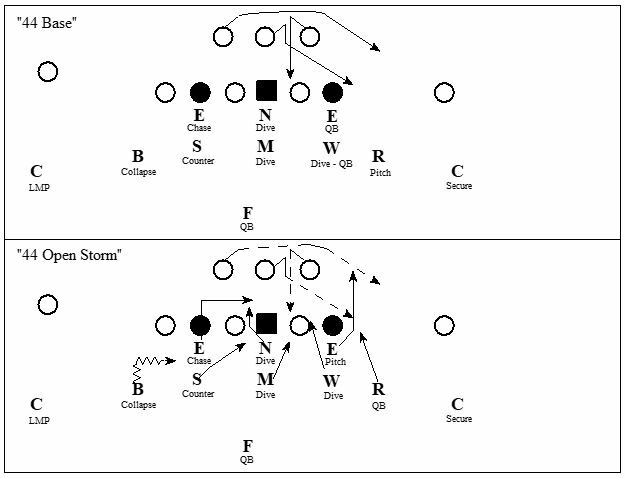 The midline option can be run, but the read is wide (4-technique) and the nose in a 0-technique creates additional scheme problems. The load option, whether from the center or gun has the best opportunity for success, however the offensive tackle must be able to reach block the End, and the tight end must be able to block a linebacker that is only one position removed. Since option responsibilities are defined by gap, all of the pressure packages can be run. This is significantly different from most teams that stay away from pressure packages versus option teams. Whoever is blitzing inside to the B-gap has dive, and the outside blitzing defender, unless it is an Eagle, has the quarterback. The outside linebacker will always play pitch, however against true option teams you can change up this responsibility with the Eagles and Studs. The rules are very simple, and responsibilities change based upon pressure packages, as such an option period must be run every day. The following are some examples of defending the option. Discipline in executing option responsibilities makes the 30-Stack an effective scheme. Scouting and video study is important when preparing for a gun option team because you must determine whether the quarterback is running a true option by reading the backside EMOL. If the quarterback is making reads, it is important to change up the “ends” techniques. This will create confusion for the quarterback and create clear paths at the quarterback for defenders. Also, does your opponent run a triple option with two backs or by putting receivers in pitch relationship, or a double option only? The answers to these questions will help you game plan your pressure packages. The “Open Storm” package is shown as an example of changing responsibilities. This stunt creates a “give” read for the quarterback, because the EMOL is up field. However, there are three stacked linebackers keying on the give – dive. If the quarterback misreads, or decides to keep, the Eagle is unblocked with a clear path at the quarterback. The pitch is covered by the End, so the quarterback will most likely keep because he will perceive there is a clear lane.